ESET encourages Facebook and Twitter users to try out the new version of its social media security product ESET® Social Media Scanner, now in BETA testing. 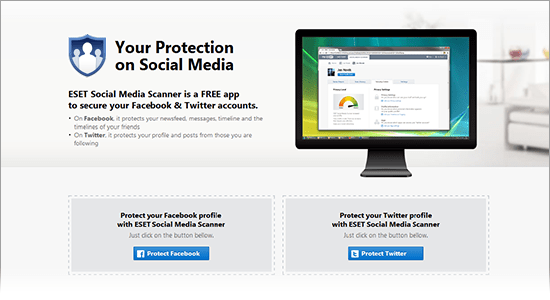 The enhanced product monitors and keeps the user and their friends’ social network accounts away from threats. Apart from better scanning of Facebook it comes with protection extended to Twitter. A part of the tool is the Security Center which displays the current privacy level on Facebook and Twitter and suggests changes in privacy settings. All improvements are part of my.eset.com account. “ESET enhanced its free security product launched at the beginning of 2013 to maximize protection of users on Facebook – monitoring and keeping the user, their friends and family away from potential threats. We are now extending this protection against malware to Twitter, protecting user’s profile and the ones that follow them which includes scanning the widely used shortened URL links”, says Mario Turner, Product Manager for Cyber Security and Social Media. The new and improved ESET Social Media Scanner, which is currently in BETA testing, allows the user to choose from on-demand and one-time scans to discover any threats. By creating an account at my.eset.com, the user can manage the protection of their social media profiles and protect an unlimited number of accounts, including those of friends and family. BETA version of the new ESET Social Media Scanner fully integrates with ESET Smart Security® and ESET NOD32® Antivirus and is managed through the my.eset.com web interface. For further information visit the BETA product page.